Me feel hassled about a canceled flight? Not in my well planned travel outfit! I spend a fair amount of time thinking about what I’m going to wear on my travel day. I probably give my travel outfit more thought than the other outfits I prepare. Why? I want to get it right because travel can be so unpredictable—like it was over a week ago. Erin and I were meeting at the airport and catching a flight to Burbank, CA where we’d Uber it to our client’s house in the Hollywood Hills. We were spending a week together creating outfits for her busy life. We’d done the same thing three years ago, but it was time for an update! On the morning of my flight, I got up, slipped into my well-planned, comfortable outfit and could easily visualize myself at the other end, arriving at 3 p.m. We were starting work the next day so this afternoon arrival would give us plenty of time to chill out and have fun in the neighborhood that afternoon and evening. The only outfit I plan out ahead of time is my travel outfit. It feels so good to be relaxed and “in control” of something before heading out on a trip. Russ drove me 35 minutes to an Airporter terminal in Marin. It was Saturday morning and there was no traffic. What joy! I kissed him goodbye, boarded the bus, and then the not-in-control part began. It was pouring down rain and the bus driver had gotten word that the freeway was closed ahead. Accident. All lanes closed. We’d have to go through Sausalito and wind through its narrow streets to get to the Golden Gate Bridge. He gave us the plan, but then the driver asked, “Does anyone know the way?” Oh boy. If any of you have visited Sausalito you know how narrow the streets are through town. He managed to take the twists and turns up the back way to the beginning of the Golden Gate Bridge. We crossed the bridge and got on to 19th Avenue and gosh, it looked like I was going to make my flight. Woohoo! And then the text came in. “Your flight has been canceled.” Holy moly. Thank goodness I was wearing my put together outfit. I was ready to face the new plan. I got to the airport and hooked up with Erin. We were rerouted to LAX and would take off in about three hours. My comfortable outfit was perfect for a hike from one terminal to another. 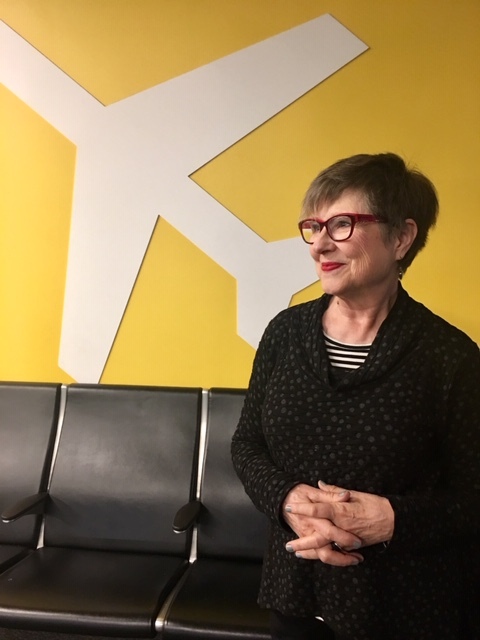 We left our Southwest Airlines Terminal and headed over to the International Terminal where we decided the people watching and restaurants would be better. The famous SF restaurant, Tartine, had gone into the International Terminal. We went through the TSA lines at the International Terminal, had lunch and gin fizzes (Erin’s idea) at Tartine with plenty of time to head back through security a third time to Southwest Airlines. 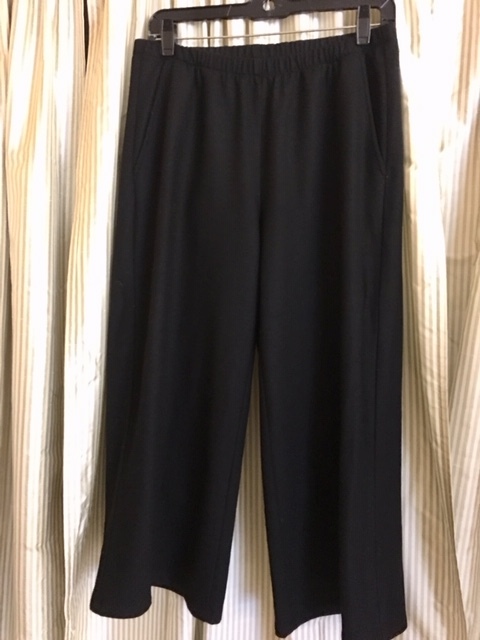 I’d been enjoying wearing my cropped full-leg Eileen Fisher wool pants that week, and I wanted to keep wearing them. Often I’m in jeans or a knit pant for flying but I wanted to wear these full pants. They have an elastic waist and they’re not tight anywhere. I really wanted to wear it my favorite way which is with a mock turtle sweater with a mix of textures, but if I got hot on the flight, I’d suffer. A turtleneck really holds the heat in. Here’s the soft draped full pant. It has pockets! Next up, the layers. I went with my soft—it’s been washed a hundred times—black and white striped tee as my first layer. 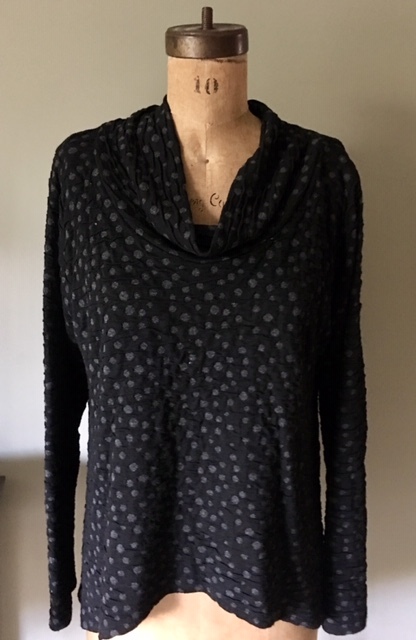 My next layer was a soft knit, textured long-sleeved Margery top that came from Artful Home. 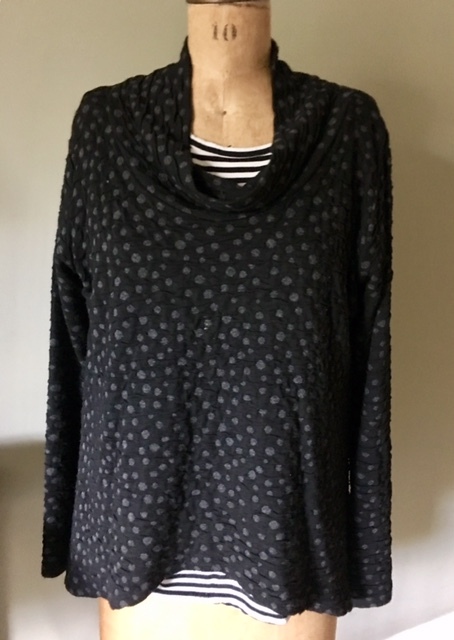 It has a loose cowlneck. I love the ease. Mixing stripes with polka dots is so entertaining to me. When you’re traveling by air, you might as well be entertained from the start! You never know what’s going to happen so wear something that makes you happy—that’s what I always say. 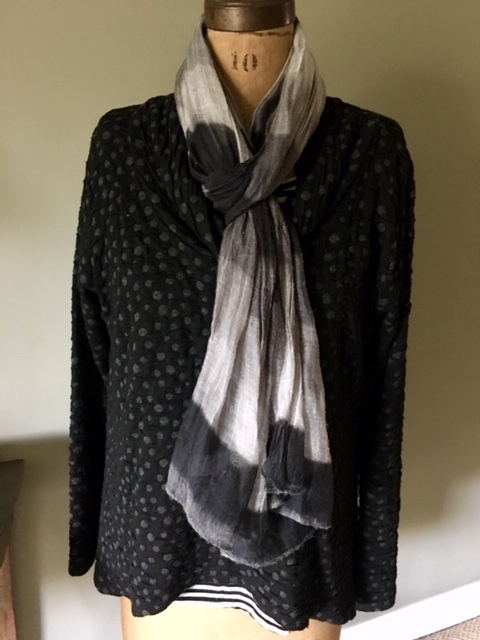 I chose this lightweight black and white scarf. It’s in a hangman’s knot. It keeps my neck from getting chilled. When I get hot or need more air, I take it off and it goes into my purse. 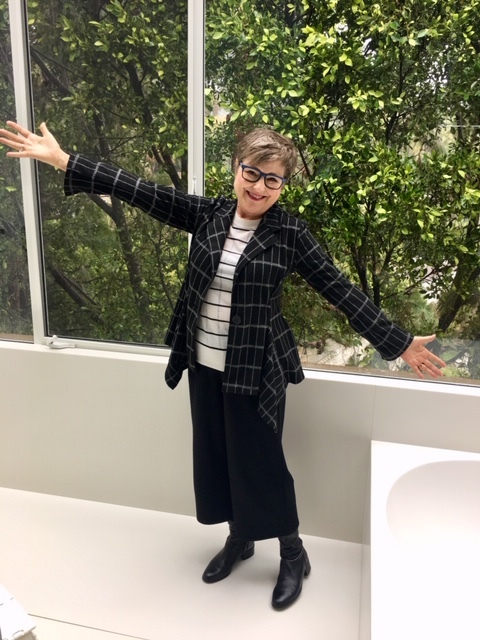 LA was in for several days of stormy weather so naturally, I brought my raincoat with a quilted liner. Once we got to our place, we dumped our suitcases and headed out to dinner. No need to change clothes; I was still happy in my travel outfit. A place called Farmhouse sounded great and it was perfect! They had the best rhubarb cake dessert. We couldn’t stop thinking about it. The work week went well. I wore the pants for two more days. I wore them to work on Monday. 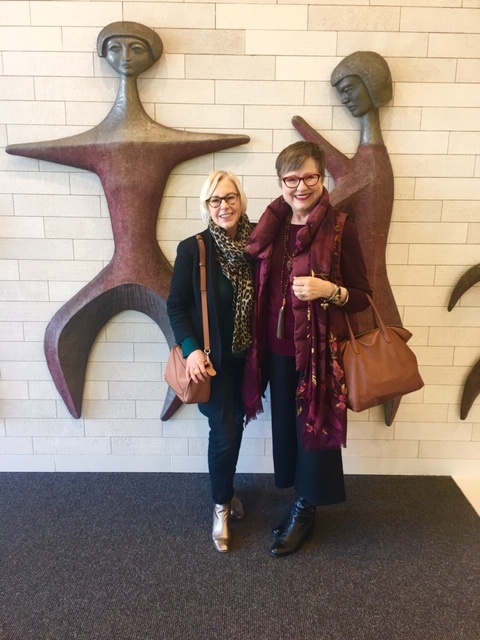 And I wore them on Wednesday afternoon when I met my friend and blogger, Susan Blakey, from Une Femme d’un Certain Age. 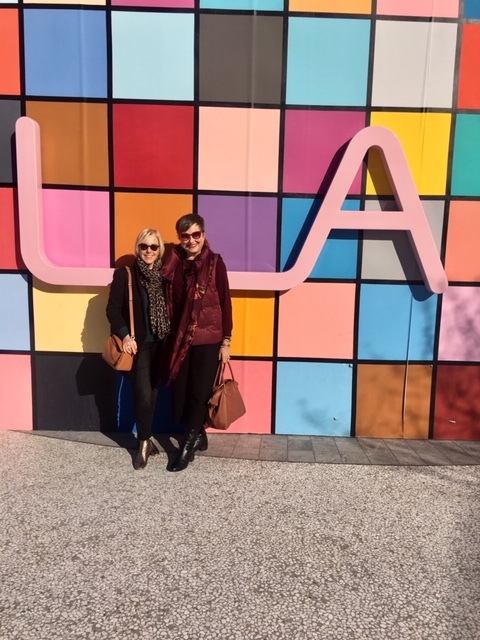 We did some shopping at the Westfield Century City Mall—a great mall! I still hadn’t tired of wearing these pants. Besides, it seemed we had dessert at every meal so that elastic waistband came in handy! By the way, I’ve been wearing my classic L.K. Bennett riding boots the whole time. They come to the knee. I haven’t worn them much this winter, but they sure got a workout last week! After the showers came the sunshine, but it was still cold! Then on Saturday morning, I put on my same travel outfit. I always wear the same outfit coming and going. It’s one less thing to think about. Our Uber driver played jazz on the radio and drove us down Sunset Boulevard all the way to the freeway. The houses, the landscaped lawns, the wide porches—oh my! The sun was shining, there were big puffy white clouds in the sky. I missed LA already. Nothing much happened at the airport. Everything was on time. We headed to our gate and got ready to board with our fellow Group D passengers. “I’m so sorry. I’ve lost a parent. I know a little bit about what you’re going through,” I said. “Yes, I know. It just smacks you in the face when you least expect it,” I said. “I’m doing pretty well, but when a kind person like you talks to me like this, I get teary again,” she said. “I’m getting teary too,” I said. 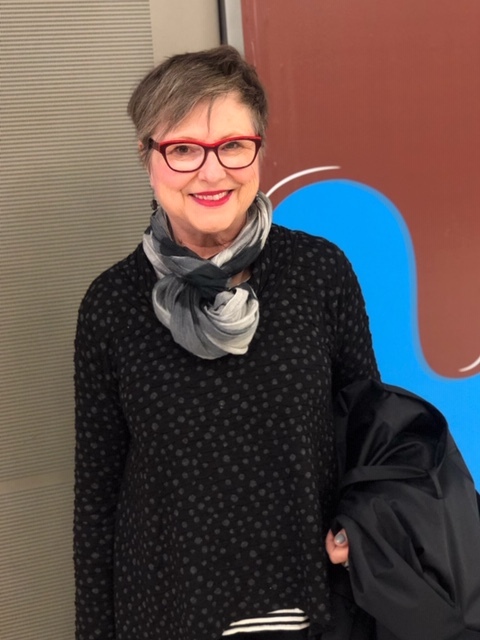 Having just talked about grief here on the blog and having read your comments, I felt like my heart was reaching out to hers with the full support of this community. When you’ve experienced grief, it’s not hard to be with someone who is going through it. It might have been nice to have been seated together. I’d have just listened. So that’s it, folks. I thought of you a lot in LA. And now I’m happy to be home, here in my office, sharing fashion stories with you. You’ve probably got a travel story to share! How do you choose what you’re wearing when you travel? Can’t wait to hear from you! Great outfit, Brenda! In the first few pictures the pants looked like a skirt. I’m sure your words to, and empathy with, the woman of the roses were very much appreciated. Yes, it’s hard to take pics of those pants because they do look like a skirt from many angles! I bet you’d have spoken to her too, Cara. I had no idea of course that she’d tell me what she did but I was honored to be there with ears to hear her. Where did you get the trench with quilted liner? From Nordstrom, on sale, about 12 years ago. It’s a stalwart piece! You are such a good person to listen for that woman in her grief, Brenda. It’s the hard part of life, yet we all go through it some way or another. As for traveling, I do about the same thing. I wear the same thing to and from the airport (with a change of the top underneath)!! I so look forward to your email fall into my in box Brenda. 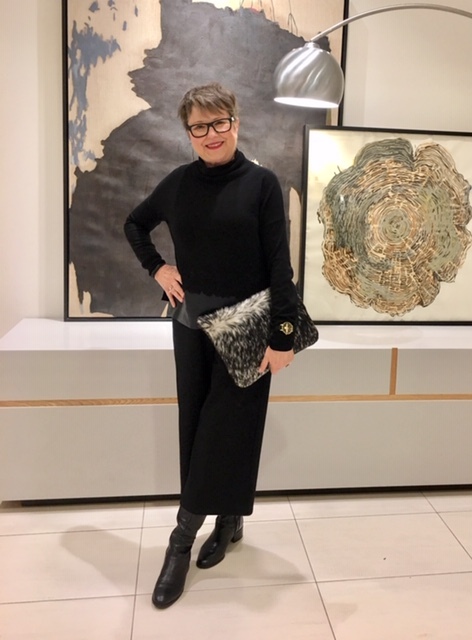 To be honest I am always at a loss to know what to wear when I travel, I know I want comfy but putting comfy together and looking so well put together (as you do) is an art, and I’m just having a hard time doing that at the moment. I’m going to keep reading your inspirational words of wisdom and working on it, (and sorting my wardrobe out!!). Looking forward to your next ‘words of wisdom’ Brenda, BIG thanks. Wendy, you’re melting my heart! I will continue to do my best to fill your email inbox! Also, put travel wardrobe in the search box (or travel tips) of the blog and several posts should pop up. Hope that helps! 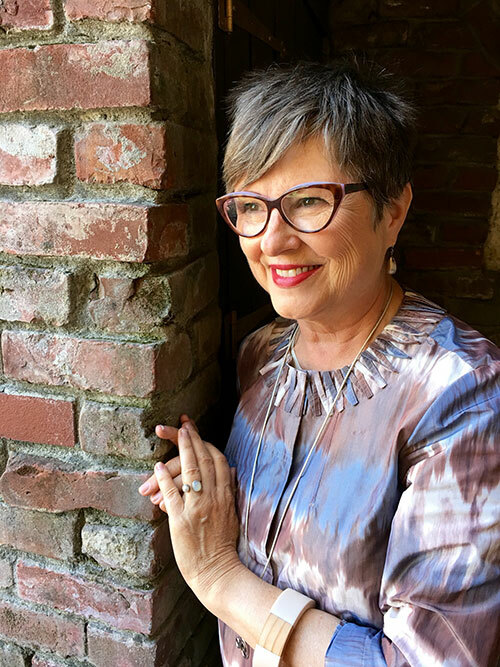 Also, my friend Susan from http://unefemme.net devotes many, many posts on travel packing. Check her out, she’s great! Hi Brenda, thanks for the travel tips. We are going to Paris at the end of April and I’m desperate to pack correctly and not overpack. 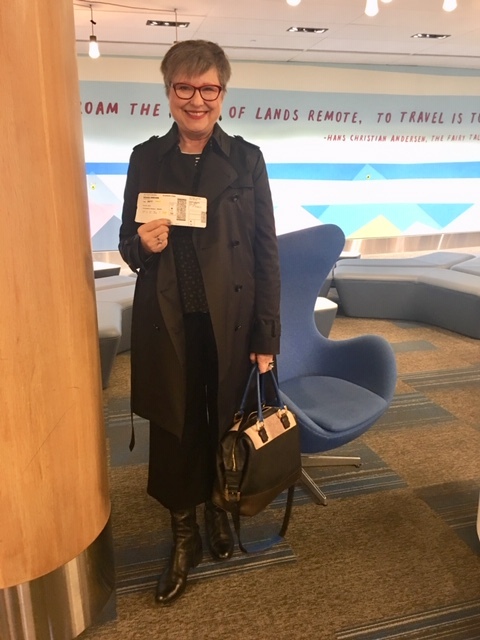 I love your travel outfit and will definitely keep in mind..
Sharon, you understand grief too! I have travel packing wardrobe charts and instructions on my website. Just go to Resources and then checklists and charts. I would plan out every outfit! 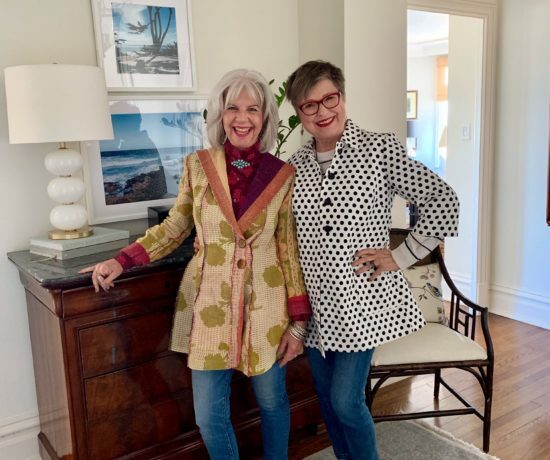 Or for my clients I often take one travel wardrobe chart and make day outfits on it and then take another one for nighttime outfits. It really does help! I hope you have a great time! Once again, you’ve moved me. Developing my own “ silver style” since my mom died. Am enjoying getting to know her distinctive style through pieces she left me. Four years after her death I’m still learning new things from her. Style is such a living language! Thanks for your kind words! Yes, I do feel really lucky! We have a good time working together. Please, copy away! Great step by step guidance! Thank you. What about the burgundy top, vest, and accessories?! Those were my favorite pieces and you didn’t mention them! You’re right! I only talked about the travel pants. The burgundy sweater is by J.Crew (years old) and the burgundy cardigan is this year by Halogen from Nordstrom. The necklace is by Sol Sisters. I’ve written about that one a lot! You can put Sol Sisters in the search bar of the blog and learn more about the necklace. Glad to know I’m not the only one who obsesses about a travel outfit. I always wear the same thing coming and going. It can be tricky when your destination climate is quite different from home. And I always take a scarf for warmth on the plane (and socks!). I never travel in jeans, just not comfy enough, especially for international travel. Knits are the key! I try to avoid tennis shoes (clunky), altho sometimes I choose black athletic gear with tennis shoes. I ALWAYS do carry on, even international. A few years ago I was stuck in airport with delayed flight and got phone call that my mom’s condition had worsened. I felt so helpless stranded there. I was the sad lady sniffling/blubbering in the waiting room. A nice lady came and chatted with me and it felt so good to tell someone what was happening. So kudos to you for reaching out! Linda, I love your travel tips and I’m really moved by the lady who reached out to you. How comforting that must have been! I wish someone had done that for me when I was flying home to my mother’s death bed hoping to make it in time. The person at the ticket desk was so uninterested when she told us that the plane was there but they couldn’t find a pilot. She was nonchalant and I was desperate. I so wish I could have spoken to someone compassionate at that moment. Also being a woman of a certain age, I have always loved that gaucho and boot look! I bet it would look just as fabulous with a pair of booties or even dark tights and loafers or ballet flats, love your posts and your style! Thanks, Nancy. So far I haven’t been able to work out a shoe option that I like as much as these boots. If the pant was longer, it would be easier for me. Thanks for your kind words! I am an ex stewardess, flight attendant, and I can tell you, the clothing worn on flights is disgraceful. It is sloppy and sometimes a lot more is hanging out than in. We flight attendants give more care and attention to a well dressed person. When I flew as a flight attendant, using a free voucher, it was mandated that we had to be in professional dress, I was often placed in first class if a seat was available. When my husband and I fly we still do the same, it has its perks. Please folks keep in mind this philosophy…. well dressed makes a good impression and you will never get a chance to make a first impression again. I am bowing down to you, Karin! Yes, yes, triple yes! I just can’t dress in a sloppy way on a plane. I have clients who follow your philosophy as well and have been upgraded because they look like they care. I’m so glad you shared your advice! How fun to see two of my favourite bloggers together! Thank you for being so kind to the woman with the roses. Sadly, people are often so uncomfortable with another person’s grief that they hardly acknowledge it let alone say anything truly comforting. I’m sure you made a difference to her day. Nice travel outfit! I too wear the same thing on both flights, provided I havn’t spilled anything! I am usually going from one kind of weather, usually winter in MN, to summer temps in FL. I make sure my travel putfit has a layer I can remove when I arrive, something that can double as a lightweight coat when I come back to winter. I admired the outfit on Instagram. I was traveling myself last week. And then you surprised me with the rest of your post. Thank you. This was a pleasure to read. How wonderful that you two were standing in line together and that you opened up the space for her to speak/share. I tend to be warm on flights and always have layers, a neck scarf, etc. However, my last flight was so cold but I didn’t realize it until after takeoff. I was wearing a shirt, sweater, polar fleece and warm scarf, but that wasn’t enough. My coat was in the overhead compartment and the fasten seatbelt sign never went off. Was I cold! I hate when that happens! I often pack gloves and a warm knit cap to help me stay warm as well. 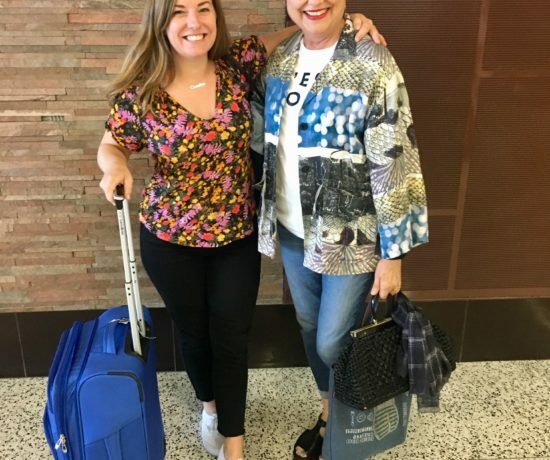 We just got back from a two week vacay in Palm Springs and my travel outfit was very similar to yours. Unfortunately coming home my suitcase was a tad overweight so ended up wearing a few more layers home then planned. Lol. Ruth, I’ve avoided that somehow! I’d love to have seen that outfit! 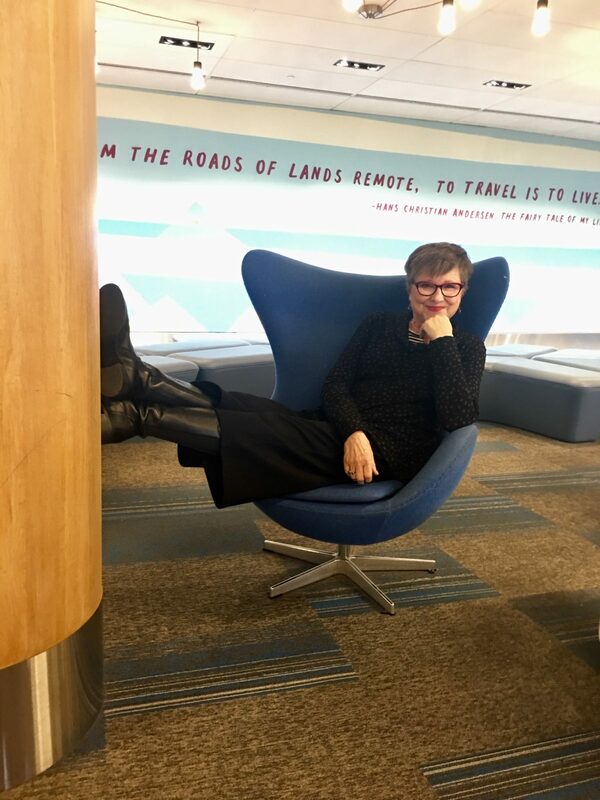 Like you I think of COLD or HOT situations……..always a scarf and a sweatshirt material Coat that can PLAY BLANKET since they do not give those out anymore on Domestic Flights!ON international flights always heavy socks for my feet…….I get rid of the shoes immediately! SUSAN what happened to YOU a week ago SATURDAY???!!!!! I thought you were coming to see me at BOOK SOUP! BIG STORM TONIGHT!!!!!! !CATEGORY 4 my PILATES instructor had said!!! I wanted to come, but we had our son with us for the weekend unexpectedly, so I had to stay home and “tag team” with le Monsieur. I’m so sorry I missed it!! I love your travel outfit. It was so great to spend time with you; I’m glad we could arrange it! And I was admiring those pants; they looked great with the boots. Brenda, I can’t remember the last time that I traveled without a pair of Eileen Fisher pants. They are the best! It is really great to see you wear and respect clothing that has a history in your closet. So often people think that you need a whole new wardrobe for a trip. Thanks for showing that it is always best to shop in your own closet first. You look wonderful, as always. I live in Australia so when I travel I need to think of an outfit that will be worn, slept in (if I am lucky!) then is presentable to wonder around in until I can get into my hotel, around 30 to 35 hours of wear. Sometimes it works but despite my best efforts not always. 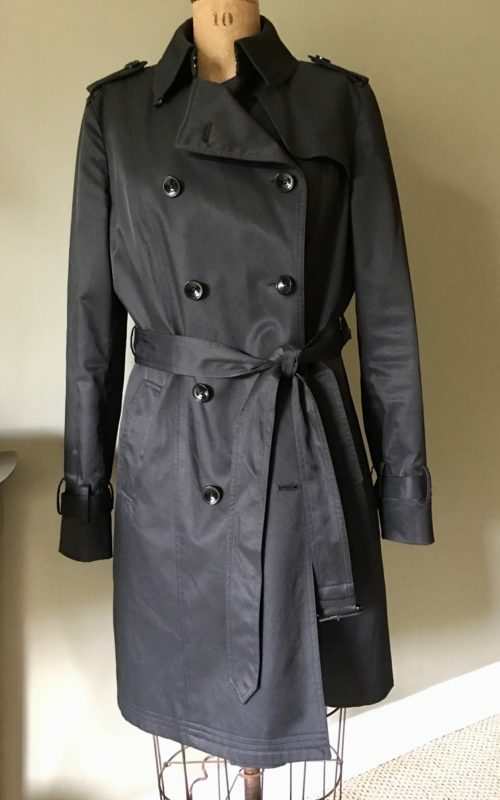 What is the trench coat brand? Thanks! I love your travel outfit! Very chic, and comfy. That bag you’re carrying with the blue handles….love it! Can you tell who makes it? Thanks for the “Aha” moment about wearing the same outfit on both travel day. I so value all your insights. 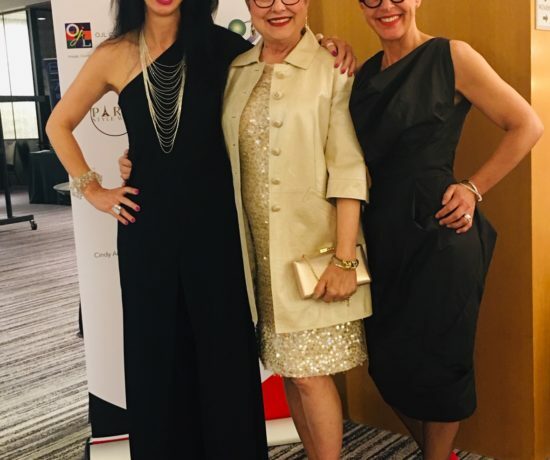 You look fabulous – a goal for all of us as we travel. The three rose story resonated deep in my heart. I was teaching 41 Grade Eights in 1979- some a challenge but most pure joy, fun with strong desire to learn. My husband got transferred and I had to resign. My last day, when the halls were empty, I was slowly walking down the hall, bringing back up so many awesome memories when I hear my name called. I turned to see three Grade Eight boys from my class, each with a gorgeous long -stemmed red rose in his hand. One looked 18, another looked 12 and the third was average in size. They all thrust their rosses into my hands and I gave them a big hug. I cried as I went to pick up my sons, ages 6 and 9, cried as we got on the plane, cried as we got to the hotel. Those three boys are forever in my heart and I feel so blessed having them there. Today I send them another warm hug from my much older self, now going to be 75, but the memory is as vivid as ever.Two different stories based on three red roses. To the woman who lost her father, I also send a hug. So many are caring and supporting you. P.S I am still processissing your grief nausea, Brenda – how true. 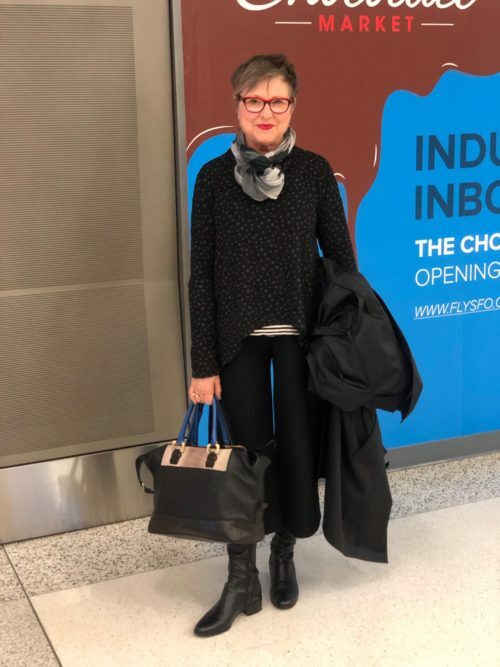 Thanks, Laurice, for sharing your travel stories/outfits with us! And I hope you do get that upgrade. Wouldn’t that be great?! Gosh, I’m so fond of 40 Over 40. What a fun book that was to write!! And it went all over the place. I always joked how that book had a much more exciting life than I did! I, too, wear the same outfit coming and going on flights. Makes the packing decisions less stressful! I hate packing and always stress over it. We always try to dress nicely, but need to dress comfortably as well. I keep a packed make up bag in my carry on. When we lost our house in the recent fires I was only able to throw some of my jewelry in my carry on bag before we fled, but I was happy to at least have small portions of make up that helped in the first weeks after the fires. i’m digressing! I like to use plastic baggies in my suitcase to store jewlery, underwear, etc. What a digression. Oh my, Betsy, I’m so sorry to hear this! That’s got to be a horror like none other. Amazing how that small thing–having portions of your makeup–helped. There’s so little “normal”. We only evacuated during the 2017 Sonoma fires. It’s so unsettling…for so long. Thanks for your tips and hugs to you! Of course I love your look. Where do I find that striped shirt. I like the idea of wearing it inside. See I have bounteous busoms so I think it works better as an undergarment as opposed to stripes going the wrong way. I too like to look presentable . Is it my generation? Gee, you’re right I do wear the same thing coming and going. Well, you look great. I can attest for that. You look great all the time. Plus you have the best way to tie a scarf. And where did you learn a hangman’s knot? Huh? What have you been doing lady? That is a bit of a harsh image for a scarf tie, isn’t it? 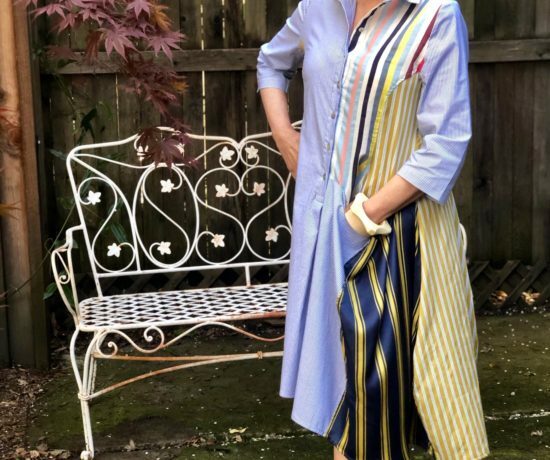 I got a great striped shirt while I was in LA shopping with Susan B. We were at COS. Great price too. I think the one in this outfit was “accidentally” lifted from Erin’s closet when I was at her apartment. But she never said anything about it when we were on the plane so I think I’m safe! Mine are partially bounteous. I hadn’t thought of that as a good reason to use it as a layering piece but I like the way you think! Sending you a hug! I’ve seen the striped T is many of your pictures and it always seems to “go”. Did I miss your mentioning the brand? I can’t seem to find it in any of your posts. Well, Cindy, this brand is “Stolen from Erin’s Closet”. It may have come from Erin and Caitlin’s consignment store, but I actually think I used it once when I was at her house in SF and brought it home with me “accidentally”. I just checked though and the label on it is Marine Layer. 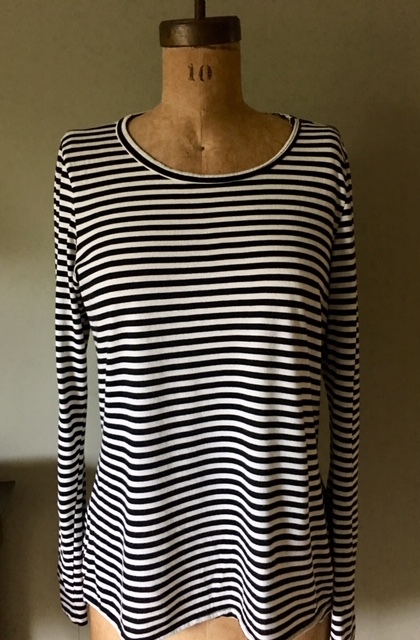 I have a striped tee from COS, one from Enza Costa and a really old one from the Caslon line at Nordstrom. I seem to collect them!